An hour later it under went significant changes to bring it in scope. Specfics are now missing that render answers of less value to the OP. Can we exercise a voluntary hold period to let OP bring question into scope before taking it over? I would have liked the OP to define "ranger" and take out the legal part. What is a reasonable period to hold off and let the OP fix the question before fundamentally changing it? Me I think 24 hours to let OP fix a question before fundamentally changing it. I am not sure this was the best approach given so more things that have gone on recently. First of my edits was necessary, since we aren't going to tell someone how to break the law. Second may have been unnecessary since questions about legality are not necessarily off topic. Totally closing the question would have hurt the site because then we would be short a number of visitors and really good answers. Big edits are a good thing, but it's worth asking the OP ahead of time anyways as I did here and here. As the editor here is my thought process on it. It clearly wasn't going anywhere as it was originally written because it was asking about how to get around existing rules. However, there was a good question inside because there the problem of access is real. So instead of complaining I went ahead and fixed the problems that I saw and left a note for Rory saying I had tried to fix them and that I apologized to the OP in advance if I had been too heavy-handed. 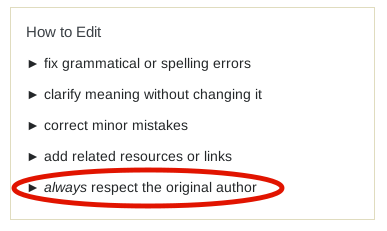 The OP has the option to edit it if they so choose. I am quite a bit late to the party, but in my opinion the conclusion here is flawed because the question after the edit is so good. I think we agree that the question after Charlie Brumbaugh's edit is much better, the stats he posted concur with that. Nevertheless the question after the edit is a different question. Answers are relevant to the original question, as they are about the same topic, but they are not directed at this specific problem. One aspect was the disparity between the rules applied by authorities and the missing information of the climbing community (no signs, ...). This is obviously much more boring and less useful for a greater public than what the edit asks, but it is a legitimate question. In my opinion this question should have been closed as unclear or too broad. Charlie Brumbaugh's question should have been posted as a new question. And I completely forgot the licensing stuff brought up in comments: That's a joke right? Sure the license allows for extended edits, but the license is not what defines how the community works. It is vice versa: The license (should allow) allows to do what the community wants. So arguments should be about what SE wants to achieve as a community with edits, not what the license/ownership allows.